Are you dreaming of remodeling your kitchen, bathroom, or laundry room? You’ll need expert plumbers to make sure your new plumbing lines and fixtures are functional, beautiful, and professionally installed. Beehive Plumbing can bring your remodel to life with our professional plumbing services. Our work always comes with a 100% satisfaction guarantee, and, with our free up-front estimates, you’ll have a clear sense of what to expect in terms of costs—before the work begins. Contact us today for a free estimate on your plumbing remodel. We provide plumbing services in Salt Lake City, Utah and surrounding areas. Whether you’re planning to strip your kitchen, laundry room, or bathroom down to bare studs to do a custom remodel from scratch or you just want to update your fixtures, Beehive Plumbing can help. From new plumbing installations to repair or replacement of existing plumbing, we have you covered. Residential Remodel: We specialize in residential kitchen and bathroom plumbing remodel projects. No residential job is too complex or too challenging. We take pride in installing all plumbing components correctly. Not just sinks, toilets, showers, bathtubs, and faucets—we also handle less common jobs, like installing body spas or running water lines to new areas of your home. Bathroom Remodel: What’s your bathroom dream? Does it include a new tub? A separate shower? A walk-in shower? Matching his and hers sinks? A bidet? A urinal? Our expert installation team can make any dream a reality. Kitchen Remodel: What does your old kitchen need? A fresh, new sink? A fixture with a pull-out faucet? Appliance hook ups for a garbage disposal and dishwasher? Supply lines for a refrigerator water dispenser or ice maker? We’ve done all that, and more. Laundry Room Remodel: Does your laundry room need new hookups for a washer and dryer? Maybe a new drain? Or a utility sink? We can help. Commercial Remodeling: We also provide commercial remodeling plumbing services. Need a new three-sink installation for your restaurant? Or maybe you’d like to convert an old grocery store into a laundromat? No matter what plans you have for remodeling your business, we can perform your plumbing installations and services. Our experience, expertise, and integrity will ensure you get the best plumbing remodel possible. Remodeling can be more complex than a new installation. 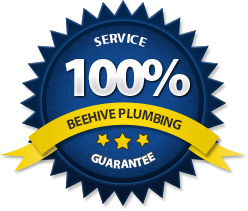 With Beehive Plumbing, your job will be well done, professionally. Our expert plumbing team is licensed, bonded, and insured with $3,000,000 in liability insurance. Our years of experience will ensure that your kitchen and bathroom remodel complies with current plumbing codes. We also play well with other contractors. We know that a remodel involves many different steps and many actors. We arrive on time, complete our work on schedule, and make sure your project can move on to the next stage. Our passionate commitment to a superior level of customer service is backed by our 100% service guarantees. Call Beehive Plumbing today about any bathroom, kitchen or other plumbing remodeling needs you may have.